This volume reflects the outcome of six HIC-HLRN Land Forums in MENA (2009–17) of civil society actors in the Middle East/North Africa (2009–2013). It collects working papers, analyses and testimonies of land struggles with maps and illustrations that are rarely found together in published form. This compilation presents these rich and varied materials in 39 chapters organized in ten thematic sections, covering the subject of land in Middle East/North Africa cultures; tenure rights; gender; right to the city; indigenous peoples; conflict, occupation and war; globalization; land and revolution; and constitution and policy reform. 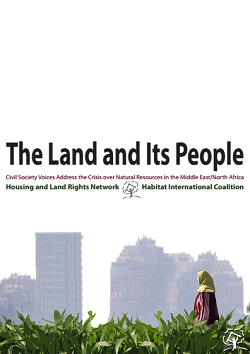 This 2018 edition updates and expands on the original edition published in 2015 as a living document that keeps pace with unfolding events and developments, as do the successive rounds of HLRN’s Land Forum in MENA. Gentrification: investment opportunity or community loss?